Kanchanaburi (Thai: กาญจนบุรี, [kāːn.t͡ɕā.ná(ʔ).bū.rīː]) is the largest of the western provinces (changwat) of Thailand. The neighboring provinces are (clockwise, from the north) Tak, Uthai Thani, Suphan Buri, Nakhon Pathom, and Ratchaburi. In the west it borders Kayin State, Mon State, and the Tanintharyi Region of Myanmar. Tourists are attracted by the history of its ancient civilization and the World War II Bridge over the River Kwai (also spelt "Khwae"). The province is in the west of Thailand, 129 km from Bangkok, and covers a total area of approximately 19,483 km². It is the country's third largest province, after Nakhon Ratchasima and Chiang Mai. Topographically, it is covered with timber and evergreen forests. The district covers the source valleys of the rivers Kwae Yai and Kwae Noi ("River Kwai"), which merge at Kanchanaburi city to form the Mae Klong River. Bong Ti is a transnational border crossing point, which is expected to gain in importance if the planned Dawei deepwater port project goes ahead, along with a highway and a railway line between Bangkok and the port. Several national parks are in the mountainous forest areas of the Tenasserim Hills of the province: the Erawan, Sai Yok, Khao Laem, Thong Pha Phum, Khuean Srinagarindra, and Chaloem Rattanakosin National Parks. The Thungyai Naresuan Wildlife Sanctuary is on the UNESCO world heritage list. Archaeological remains found in Kanchanaburi date back to the 4th century, with evidence of trade with surrounding regions at that time. Very little is known about the historical Khmer influence in Kanchanaburi, but Prasat Muang Sing, one of the country's most well-known Khmer sites, provides evidence of their occupation. Not much was historically recorded about Kanchanaburi Province before the reign of King Rama I, but some historians believe that the province was of strategic importance during the Ayutthaya period, since it was on the invasion route from Burma. In 1982, many human and elephant skeletons and swords were found in Phanom Thuan District, leading to speculation that this site might even have been the site of the famous battle of King Naresuan against the Burmese crown prince, most commonly assigned to the Don Chedi District in nearby Suphanburi Province. Most foreigners are mainly aware of Kanchanaburi's recent history with the Death Railway. During the Japanese occupation of Thailand in 1942, both allied POWs and Asian labourers were ordered by the Japanese to build a Thailand-Burma railway. Eventually, more than 100,000 people (16,000 allied POWs and 90,000 local Asian labourers) died from horrific working conditions. The seal of the province shows the three stupas on Bantadthong Mountain. They give the name to the mountain pass to Myanmar, called "Three Pagodas Pass". The provincial flower is the night-flowering jasmine (Nyctanthes arbortristis). The provincial tree is the Moulmein lancewood (Homalium tomentosum). The provincial slogan is "A province of ancient community, three pagodas pass, precious stones, River Kwae Bridge, minerals and waterfall resources". Kanchanaburi is divided into 13 districts (amphoe). The districts are further subdivided into 98 communes (tambon) and 887 villages (muban). Only 129 km from Bangkok, Kanchanburi is a favourite holiday destination for Bangkokians and other Thais residing in the central region. For most foreigners, Kanchanaburi's historical significance stems from The Bridge Over the River Kwai, built by forced labour during the Second World War. 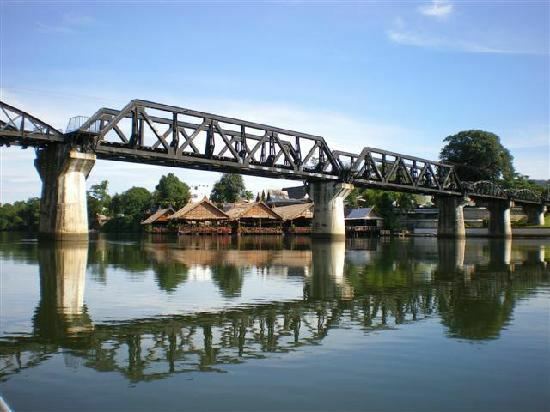 The famous bridge, known to many from the film, The Bridge Over the River Kwai, was built next to the town of Kanchanaburi, crossing the Mae Klong River. The Death Railway ran all the way from the Kwae River valley up to Three Pagodas Pass. Today, only the lowest part of the railway to Nam Tok is still in use. 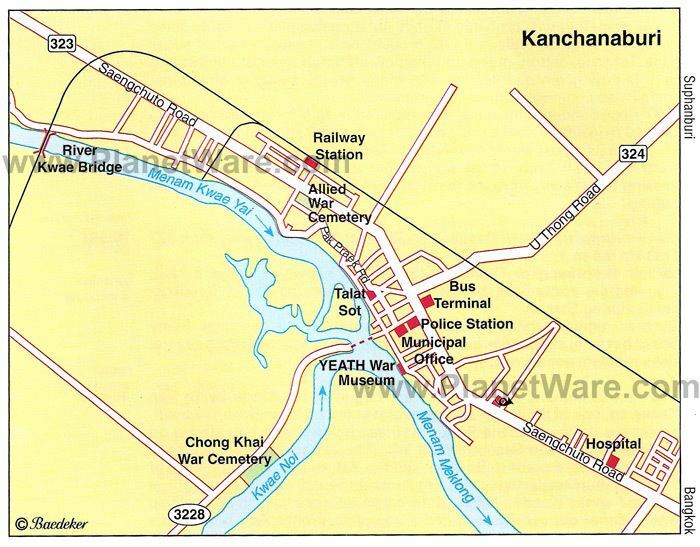 Kanchanaburi city has a war museum and a large POW cemetery. Nine Army War History National Park (Uttayan Haeng Chart Songkram Kao Tab) at Ladya field, Tambon Chongsadao, is around 40 kilometers from Kanchanaburi city. This place has provided historical evidence of the Nine Armies War between King Rama I of Thailand and King Bodawpaya of Burma, from which Thailand emerged victorious. In the Sai Yok District, there is a Buddhist tiger temple where tame tigers roam freely once a day. Also in Sai Yok is the Mueang Sing Historical Park, ruins of a Khmer town and temple, as well as the Sai Yok National Park with the two Sai Yok waterfalls. Kanchanaburi War Cemetery (Don Rak) (สุสานทหารสัมพันธมิตรดอนรัก) The immaculately maintained cemetery contains the remains of 6,982 Allied POWs who perished during the construction of the "Death Railway". Death Railway (ทางรถไฟสายมรณะ), the strategic railway tracks began from Nong Pla Duk Station in Amphoe Ban Pong, Ratchaburi, and ran via Kanchanaburi across the Khwae Yai River, westbound to the Three Pagodas Pass, to end at Thanbuyuzayat in Burma. Total length in Thai territory was 300 km. The railway took only one year to complete, from October 1942–October 1943. After the war, some lengths of track were demolished and some submerged under the lake of Khao Laem Dam. Mueang Sing Historical Park (อุทยานประวัติศาสตร์เมืองสิงห์) is better known as Prasat Mueang Sing (ปราสาทเมืองสิงห์), The laterite sanctuary was constructed in the late Lop Buri Period, c.11–13th centuries CE. Influenced by ancient Khmer culture, its principal tower is encircled by a laterite wall, moat, and earthen mound. It was built in a mixture of the folk school of art and Bayon-style of King Jayavarman VII's period in Cambodia. Hell Fire Pass Memorial Museum (ช่องเขาขาดพิพิธภัณฑสถานแห่งความทรงจำ) Established by the Australian Government, it houses a theatre and collection of photographs, equipment, and utensils used during the construction of the Death Railway. Sai Yok National Park (อุทยานแห่งชาติไทรโยค), a park since 1980, most of the area is limestone mountains with mixed deciduous forest. It is a former site of a Japanese camp during WWII as evident from traces of stoves. The park is home to the world's smallest species of bat. Wat Pa Luangta Bua Yanasampanno (วัดป่าหลวงตาบัว ญาณสัมปันโน) commonly referred to as Tiger Temple, is a controversial tiger conservation area where wild, as well as domestic animals, live together freely and are friendly to the monks and visitors. Erawan National Park (อุทยานแห่งชาติเอราวัณ) Formerly called Khao Salop National Park (อุทยานแห่งชาติเขาสลอบ), it was proclaimed a national park on 19 June 1975, with an area of 373,735 rai (597,976,000 m2). Later, its name was changed to Erawan National Park as the highest level of the waterfall, Namtok Erawan, looks like Elephant Erawan's head. Khuean Srinagarindra National Park (อุทยานแห่งชาติเขื่อนศรีนครินทร์) It was made a national park on 23 December 1981. It has an area of 953,500 rai (1,496,800,000 m2). Attractions include Tham (cave) Sawan (ถ้ำสวรรค์), Tham Neramit (ถ้ำเนรมิต), Tham Nam Mut (ถ้ำน้ำมุด), Tham Phra Prang (ถ้ำพระปรางค์), Namtok (waterfall) Huai Mae Khamin (น้ำตกห้วยแม่ขมิ้น). Star gazing Kirdkao Observatory (หอดูดาวเกิดแก้ว) in Tambon Lum Rang, is a place to gain knowledge about stars and nature. A corner for star watching is arranged, an observatory in a dome shape and accommodation in a capsule shape. Forest trekking Sangkhla Buri Jungle Trek This service is offered to tourists by hotels in Amphoe Sangkhla Buri. The programme starts with rowing boats along Huai Song Ka Lia, riding elephants, and rafting. Mountain biking Mountain biking is very common in the province. Rafting, Canoeing, White Water Rafting are also very common along various routes such as Noi River, Kwae River Song Ka Lia River. Elephant trekking Kanchanaburi has many elephant camps providing elephant trekking. Around Kroeng Krawia Swamp near Namtok Kroeng Krawia, Amphoe Sangkhla Buri. Golf Kanchanaburi’s rural areas are home to several golf courses. The courses are popular due to their close vicinity to Bangkok and natural scenery. Ban Nong Khao is a district in Kanchanaburi, about 12 km away from the province. Villagers here still live simply in an agricultural society and old-style houses practicing culture and traditions which has been transmitted from generation to generation. Homestay at Ban Khao Lek Ban Khao Lek is a small Karen village, in the middle of a valley in the area of Chaloem Rattanakosin National Park with splendid nature. Most villagers earn a living by farming and collecting products from the forest. They live a simple life and mainly rely on nature. They practice Karen culture from generation to generation. In Kanchanaburi, there are two seedless raisin vineyards for visiting. Rai Khun Mon in Tambon Nong Kum is a mixed cultivation farm with organic vegetables and plants of various kinds of processed agricultural products such as corn milk, vegetable juice, dehydrated banana or jack-fruit, vegetable juice-coated Krayasat dessert, bio-diets for health. Suan Onanong Chuan Chom It is the largest desert rose ("chuan chom" in Thai) garden in Kanchanaburi with an area of 40 rai (64,000 m2). In 1918, alluvial sapphire deposits were discovered near Bo Ploi. It was a major source of sapphires in the 1980s and 1990s. Kanchanaburi Province is the site of Klity Creek, a waterway heavily polluted by the practices of the Lead Concentrate Company. The company was ordered by a Thai court to clean up its environmental damage in 2013. To date (2016) the court ordered clean-up has been halting and ineffectual. Ram Yoei is a local dance of the Kanchanaburi local people that has been performed for more than 500 years. They perform Ram Yoei on Songkran Day and New Year, etc. Men and women must form a circle, one person will lead to sing and another will sing to the other’s lyric in reply, and Luk Khu (chorus) will sing along and dance to the rhythm of Klong Yao drums. At present, Ram Yoei is performed only in Amphoe Phanom Thuan. Most of the local rural people work in the field of agriculture. Even though most of them are of Thai ancestry, there is also a lot of Mon and Karen blood around. Mineral Water and Waterfall Bathing Day (งานวันอาบน้ำแร่แช่น้ำตก); held at Hin Dat Hot Spring, at the beginning of November. In the festival, there are booths of agricultural products and tourism exhibition of Amphoe Thong Pha Phum. Visitors watching will have a chance to bath in the Hin Dat Hot Spring and enjoy the view of Namtok Pha Tat. Boat and Raft People’s Day (งานเทศกาลชาวเรือชาวแพ); held every year at the beginning of November at Song Khwae Road near the riverside in front of the city of Kanchanaburi. Activities are folk performances, Thai typical music performance, academic exhibition concerning conservation of rivers and canals, water sports such as riding long-boat, speed-boat and jet-skiing. River Kwae Bridge Week (งานสัปดาห์สะพานข้ามแม่น้ำแคว); held every year around the end of November until the beginning of December to commemorate the significance of the Death Railway and the Bridge over the Khwae River taking place in World War II. Visitors can see the historical and archaeological exhibition, folk performances, booths of products, entertaining activities, and light and sound show. Kanchanburi is known for its freshwater fish. The most popular dining areas are the Song Kwae Road waterfront area and the riverside restaurants in the vicinity of the River Kwai Bridge. 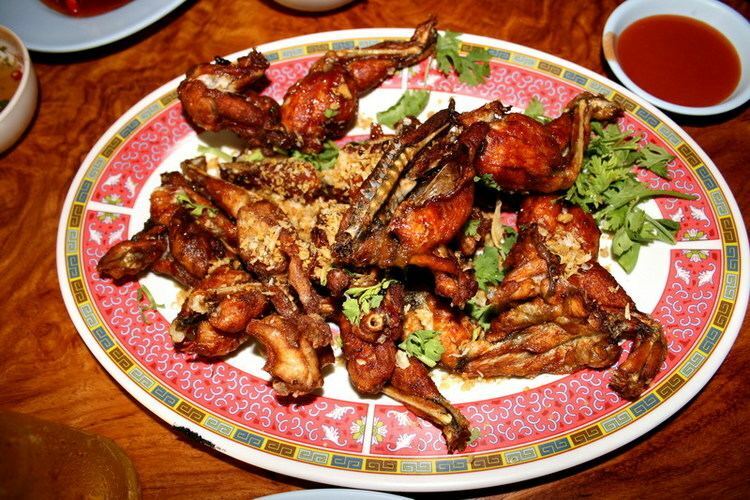 There are "jungle" food restaurants selling illegal imported meat of endangered animals from Burma. In town there is the Kanchanaburi Memorial Hospital and lots of clinics and pharmacies.